Bookmobile Comes to Streams of Hope! All aboard the Bookmobile! 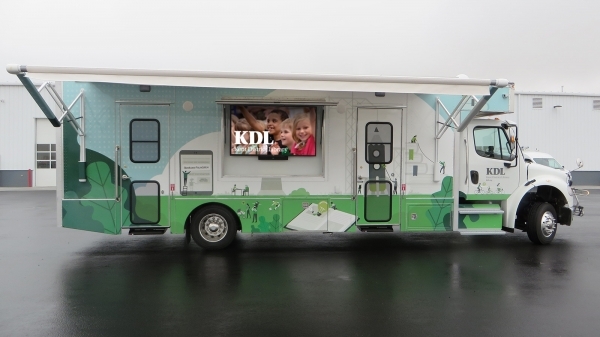 Kent County’s very own traveling library is coming to Streams of Hope. The dates scheduled so far are January 30, February 13, and February 27 from 4:30 – 7:00pm. Volunteers from the Grand Rapids Youth Foundation will be assisting, and popular children’s author/artist and entertainer Kevin Kammeraad will be “the driver” for at least two of those dates. Look out for updates on Facebook and Instagram for more information! The Bookmobile features books for ALL ages, magazines, video games, and even Wi-Fi and smart tablets available for use! We extend this invitation to everyone in the Streams of Hope community, but we would like to especially encourage parents and children of our tutoring program to come. Parents can visit the Bookmobile with their children either before or after tutoring. The Bookmobile accommodates a small seating area, but all books are available to be checked out with a library card as well. If you don’t have one, the Bookmobile can issue cards right away! Learn more about Bookmobile here. We hope to see you all there!